At this moment, the news media is constantly clamoring about the “Three Ds” that are buffeting the markets: debt, deleveraging, and deflation. We intuitively sense that they’re linked — but how, exactly? Understanding this linking is critical; as debt has fueled the global expansion, it will also dominate its contraction. To illustrate the forces of debt and deleveraging, let’s consider a home mortgage. Suppose a buyer of a $100,000 home qualifies for a mortgage that requires only a 3% down payment in cash. The buyer ponies up $3,000 in cash and obtains a $97,000 mortgage. The cash collateral is thus leveraged about 33-to-1: Each $1 in cash has been leveraged into $33 of borrowed money. Let’s say the owner wants to refinance at a later date, and to qualify for the new loan he must have 20% collateral for the new loan. (This is a simplified scenario; we will consider more complex examples later.) If the house value remains around $100,000, then the owner must boost collateral by paying down the mortgage $17,000. This boosts collateral to $20,000 (20%) while reducing the mortgage to $80,000. The leverage has been slashed from 33-to-1 to 4-to-1: now each $1 of collateral leverages $4 of borrowed money. This is deleveraging. Another common example is a margin stock-trading account. J.Q. Speculator can leverage his cash collateral 2-to-1 via margin: If he has $100,000 cash in his account, he can buy $200,000 of stocks. If (heaven forbid) the stocks he purchased decline in value by $50,000, then his collateral has shrunk to $50,000. Since margin accounts cannot exceed a 2-to-1 leverage, he must either sell enough of his portfolio to return the leverage to 2-to-1 (that is, $50,000 in cash value and $100,000 in stocks), or he must deposit another $25,000 in cash (that is, $75,000 in cash/cash value) to collateralize the $150,000 in stocks he owns. When credit is cheap and abundant, prices of assets tend to rise in self-reinforcing bubbles. If J.Q. Speculator’s portfolio of $200,000 rises by 50% to $300,000, then his collateral increases to $200,000. This expansion of collateral enables him to buy another $100,000 of stocks, as $200,000 in cash value can leverage $400,000 in stocks. The same mechanism enabled home owners to leverage up their rising equity to buy additional homes. When the debt cycle turns and asset bubbles pop, collateral declines and lenders are stuck with losses as over-extended borrowers hand the keys to underwater houses back to the lenders. These losses are subtracted right off the bank’s own equity (cash reserves), which are typically a modest 4% of loans outstanding. That is, the bank leveraged each $1 of cash collateral into $25 of mortgages. If mortgage losses eat away that 4% of cash, then the bank is technically insolvent. As a result, banks become wary of extending risky loans in eras of credit contraction: Their fiscal survival focuses their attention on dumping liabilities and building cash reserves (collateral). The credit spigot is turned off, and all those down the line who were counting on easy abundant credit to bankroll their leverage are left high and dry. As credit contracts, demand for assets and commodities contract, and a wave of selling begins as cash is desperately in demand. In an extreme example, if a bank has $1 million in outstanding loans and has suffered losses such that its cash has declined to $1, it is leveraged 1-to-1-million. It must liquidate enough liabilities and concurrently raise enough cash to restore its 1-to-25 leverage (i.e., 4% of the outstanding loans are in cash reserves). The problem is that liquidating liabilities requires the bank to absorb any losses generated by the sale/write-down of loans. If the bank sells a house for $50,000 that carried a $100,000 mortgage, the $50,000 loss is subtracted from its cash reserve. The bank has a difficult mandate: Get rid of as many liabilities as possible without incurring losses that will bankrupt the bank. The alternative strategy is to sell unleveraged assets to raise cash or slowly build cash by earning interest. If the bank’s management is dominated by wise-guy “operators,” then it might pursue another strategy, selling derivatives against assets it doesn’t own. The derivatives are sold for cash and hedged against losses by buying derivatives covering the other side of the trade from another institution. The difference between the revenues from selling the derivative contract and the cost of the hedging contract is pure profit that bolsters the bank’s collateral. If the derivative contract expires or executes as planned, the cash earned from the sale of the derivatives is pure gravy. If the derivative contracts trigger losses, then the bank turns to the other institution that it bought the hedge from to make good the losses. If that institution fails to make good, or the losses of the bank’s derivatives are not fully covered by the hedge, then the bank must raise enough cash to pay the buyer of the derivative. The need to raise cash by selling assets leads back to the original problem. Liquidating liabilities, such as mortgages, by selling the underlying assets (houses) forces the bank to book losses it is ill-prepared to absorb. This example illustrates the pernicious dynamics of debt and deleveraging. The bank cannot declare the true value of its assets (houses that have fallen in value), nor can it sell the houses and take the resulting huge losses, as its cash reserve (collateral) is already at dangerously high levels of leverage (or even negative — i.e., the bank has no real collateral at all and is insolvent). Ascertaining the true collateral of any household or enterprise is straightforward. Sell all of the assets on the open market and pay off all of the liabilities. The cash remaining is the collateral. 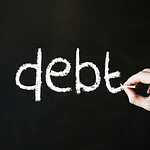 In highly-leveraged households and enterprises, the impaired assets are held, as the sale of the underlying asset would force the entity to declare its insolvency. So homeowners who are “underwater,” i.e., their mortgage exceeds the value of their home, continue paying the mortgage because selling the house would require them to come up with the difference between the value and the loan in cash. The alternative is to declare bankruptcy and give up any hope of leveraging future income into new loans. The same basic mechanism is at work in companies and banks. Ironically, perhaps, the process of raising cash by selling assets inevitably places a premium on unleveraged assets such as precious metals, collectibles, Grandma’s house that is now owned free-and-clear by her heirs, etc. Everything that has been leveraged is held, lest its true value be disclosed by the market, while everything that has retained some measure of its cash value is unloaded to raise cash—either to pay the interest on debt or to recollateralize the entity’s shaky finances. The key point here is that the outstanding debts far exceed the cash value of the underlying asset; selling everything including the kitchen sink doesn’t even come close to paying off the entire debt. Selling everything that isn’t nailed down simply maintains the much-valued illusion of solvency and puts the reckoning off for another day. The hope of course is that assets will reinflate to their old bubble valuations, but the forces of deleveraging outlined above power relentless selling that eventually overwhelms supply. The market “discovers” price as demand transparently interacts with supply. When supply exceeds demand, prices fall. And since price is set at the margin, even modest imbalances of supply and demand can lead to cascading declines in prices. For example, the value of a neighborhood of 100 houses is not set by the sale of all 100 homes; it is set by the last few sales. Thus the last five sales determine the value of the other 95 homes. Deflation is simple to define: Cash buys more real goods and services than it did last year. Cash is what’s in demand, and assets that depend on credit are not in demand. Rather, they are being sold to raise cash. It’s simple supply and demand: Cash rises in value as it’s in demand, and assets decline as the demand is lower than the supply. In Part II: The Deleveraging Pain Is Just Beginning, we look at how much longer the U.S. might need to recover from its long deleveraging hangover from multiple global asset bubbles, and why building cash (and cash equivalents) at this time is especially prudent.